An unfortunate complication of a facelift is skin that is stretched too tight during the closure. 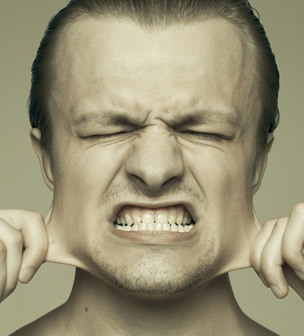 Suturing the skin together under tension can lead to an unnatural, pulled appearance (windblown face) or unacceptable scarring in front of the ears. This completely avoidable complication is actually becoming more frequent. Why is an avoidable facelift complication becoming more common? A recent trend has increased the incidence of skin being pulled too tightly after a facelift. A desire for minimally invasive, 60 minute facelifts with less downtime has actually increased the risk removing too much skin. A traditional facelift is performed in two layers: the skin layer and the muscle layer. In this type of facelift the muscle layer is sutured tightly to improve the jaw line, neck and jowls. The muscle layer gives results up to 10 ten years. After the muscle layer is recontoured the skin is lightly draped over the top and sutured together without any tension. In comparison, a 60 minute facelift / lunchtime lift / minilift relies on pulling the skin tightly together without any (or minimal) recontouring of the muscle layer. When the muscle layer is not properly redraped, the skin needs to be pulled tighter to achieve a good result. Pulling the skin too tightly risks unnatural pulled faces and wide scars. A skin-only facelift has become popular because it is cheaper, has less downtime, and does not need to be performed in an operating room. It can be emotionally traumatic to have such a poor outcome after facelift surgery. Wide scars in front of the ears are challenging to hide with make-up. An unnatural, pulled appearance can be difficult to explain. Fixing these complications requires time, patience, and an experienced surgeon that specializes in plastic surgery of the face. It is not uncommon to have to repeat the facelift, but with the revision focusing on the muscle layer instead of the skin.